In a fast changing market we aim to provide the best, unconflicted, customer service by specialising in Corporate Access alone. To achieve this goal we combine modern and transparent technological solutions with bespoke, experienced and dedicated personal to provide optimal Corporate Access. The essence of our approach is to offer you a reliable service overcoming time and language barriers. We offer a cost effective solution to arranging your Corporate Access needs in the Asian region. We do this through working in a bespoke and transparent manner with a reliable network of experienced staff, specialised in Corporate Access. 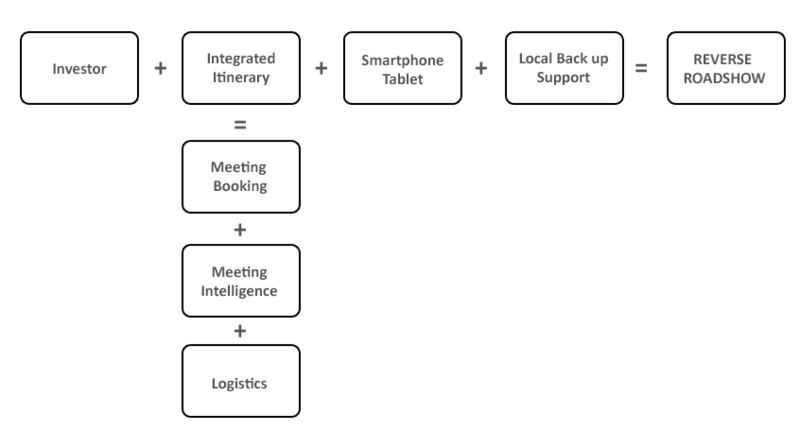 Through meeting bookings, logistics, translations and back-up, we represent you as the investor to build the best possible itinerary. To start the process simply visit yourpersonalised dashboard and fill in your trip requirements. We organise complete and integrated Corporate Access itineraries. CorpXSasia represents you as the investor in booking the corporate meetings, essentially functioning as your extended corporate network globally. When CorpXSasia books a meeting with a Corporate or expert we do so as your representative, not in our own right. Through a menu of extras we can arrange your logistics, translators and accommodation as well as non-corporate meetings with independent research analysts, carefully selected industry experts, economists, officials and journalists. What sets us apart is our provision of a bespoke, outsourced Corporate Access offering. We provide last mile access that is free from contractual commitments on a ‘pay as you go’ structure. We work off the unique model where the ‘initiating party pays’, ultimately ensuring that your annual cost of Corporate Access averages out. CorpXSasia is a team of seasoned professionals from within the industry, having built up an extensive and unrivalled network of institutional investors and corporates in all the major financial centres globally. A value add trip that you can conduct independently. A value add Reverse Roadshow, that you will be able to conduct independently, while still having the comfort of local back up and highly experienced support if required. The CorpXSasia team consists of individuals that on average have 20 years' experience in equity investment in Asia. We believe that the service we provide is competitive in terms of pricing and quality. It is free from conflict of interest, and our billing is simple, transparent and MiFID II compliant. Bridging the time and language barrier resulting in an imminently more cost effective corporate access trip. Bespoke corporate access itineraries for 2–5 investment managers to anywhere in Asia pursuing an investment theme. Register now For access to the pricing menu, your personal dashboard and live events/speakers/conferences.